Singapore’s labour market outcomes in June this year saw an improvement from the same month last year, as revealed in the Ministry of Manpower’s Labour Force in Singapore Advance Release 2018 report released on 29 November 2018. The report highlighted a growth in employment, with the rate remaining high at around 80% for residents aged 25 to 64 and continuing to rise for residents aged 65 and above. Further, efforts to raise the incomes of low-wage workers helped real income growth at the 20th percentile grow faster than at the median in the recent five years (June 2013 to June 2018), narrowing their gap with the median worker. The employment rate for youths aged 15 to 24 also increased from 34.1% to 34.5%, due to more taking on internships or vacation jobs. 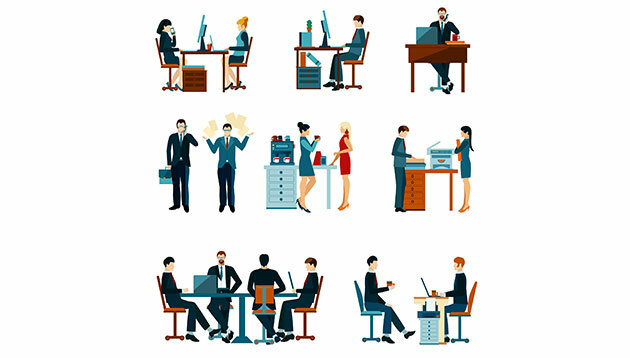 The employment rate for residents aged 25 to 64 fell slightly from 80.7% in 2017 to 80.3% in 2018. This mainly reflected a decline in the employment rate among women in their 30s, from 82.1% to 80.7%, as more stayed outside the labour force during the year to care for their families. Despite yearly fluctuations, the employment rate for those aged 25 to 64 has held mostly steady in recent years. 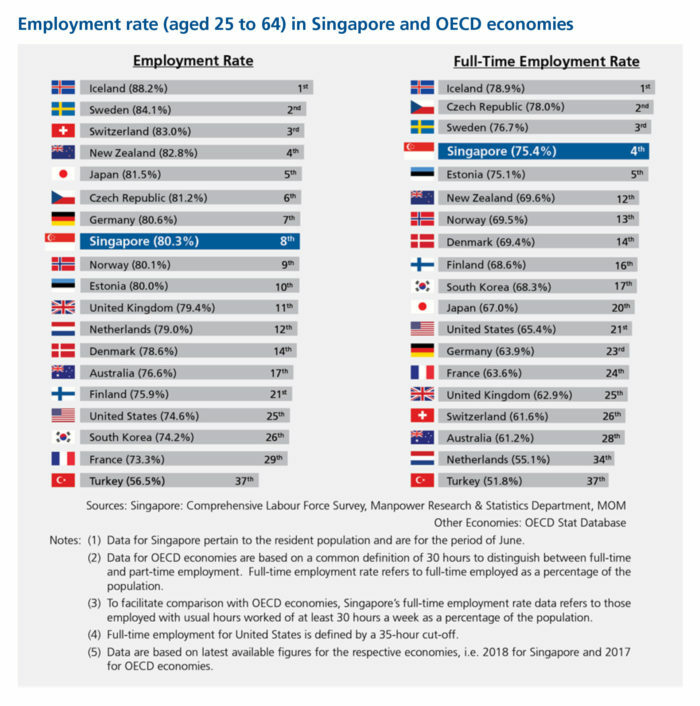 Singapore continues to rank favourably compared with OECD economies, at eighth place, especially in terms of full-time employment rate, where the nation came in fourth. The LFPR remained at 67.7% from 2017, and has broadly stabilised over the last four years. The number of women in the labour force has risen over the decade, from 43% in 2008 to 46% in 2018. 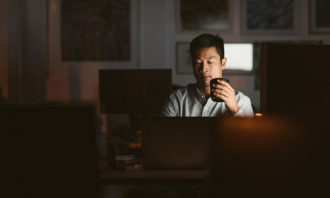 The report cited a greater prevalence of flexible work arrangements and higher education attainment among women as the reasons. The proportion of resident employees in permanent jobs declined for the second consecutive year to 89% in 2018, down from 90% in 2017. 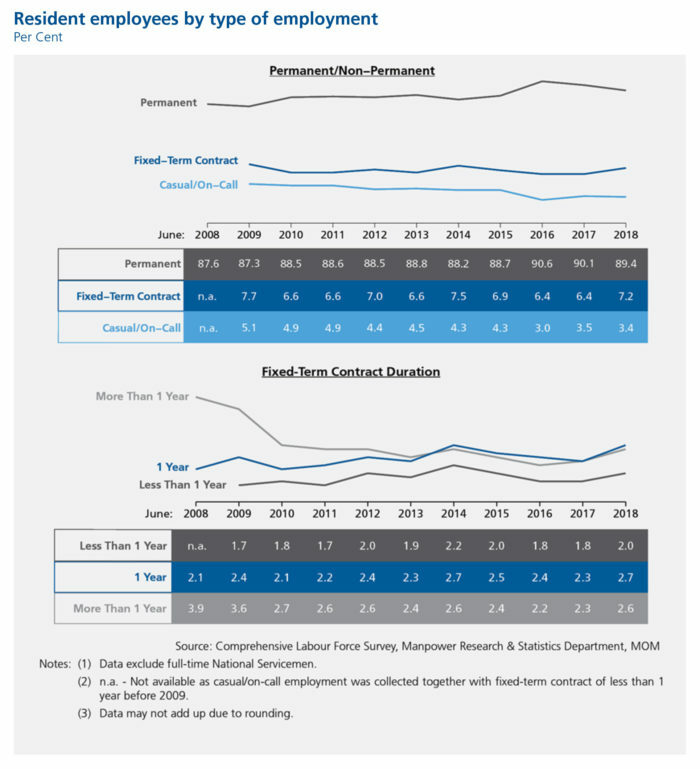 There was a corresponding increase in the proportion of employees on fixed-term contracts, from 6.4% in 2017 to 7.2% in 2018. 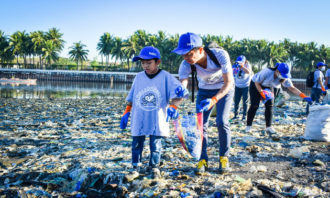 According to the report, this reflects greater caution among employers, with on-going economic restructuring prompting companies to adopt a more near-term outlook for their resource requirements. 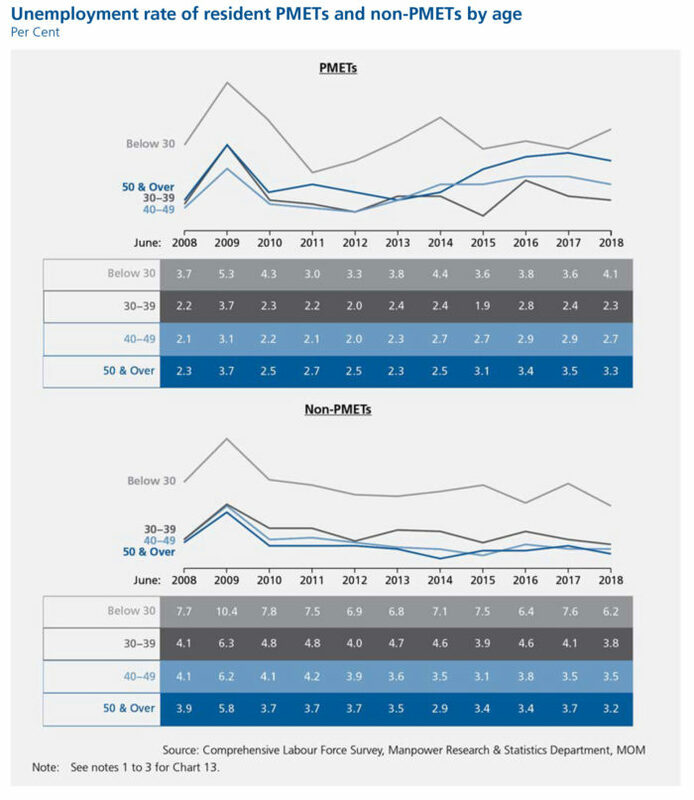 The non-seasonally adjusted unemployment rate for professionals, managers, executives and technicians (PMETs) was 2.9% in 2018, down from 3% in 2017. There was also a broad decline in unemployment amongst non-PMETs in most age groups. However, the long-term unemployment rate (LTUR) for PMETs rose from 0.7% in 2017 to 0.8% in 2018, as more unemployed PMETs in their 30s, aged 50 and above took longer to secure employment. At the same time, the LTUR for non-PMETs remained at 0.7% in 2018, with continued uptrend for those aged 50 and over but improvement for those in their 30s and 40s. The unemployment rate was higher for residents who previously worked in accommodation (6.3%); retail trade (6.0%); administrative and support services (4.7%); as well as food and beverage services (4.1%), due to the faster labour turnover in these industries. Information and communications (5.5%) also had a higher unemployment rate. 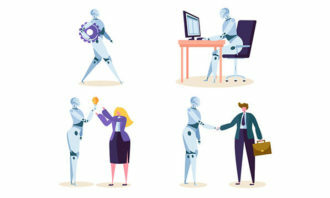 According to the report, the job search was likely tougher given the industry’s fast-evolving skills landscape. 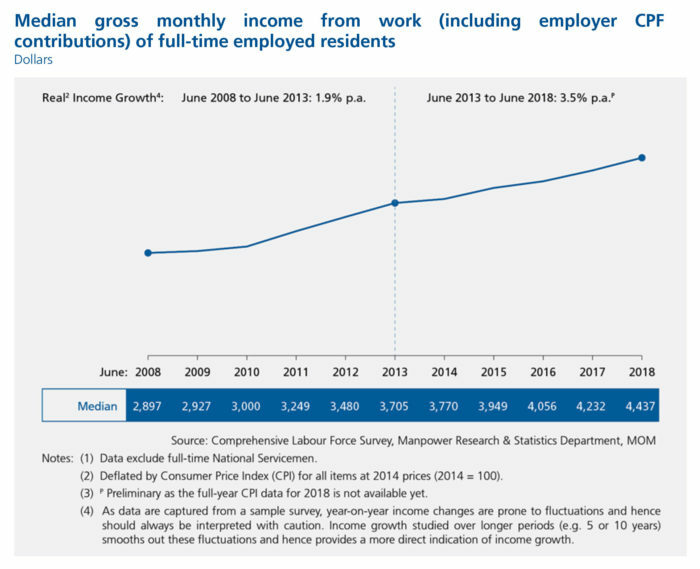 Workers continued to earn higher incomes in the recent five years. 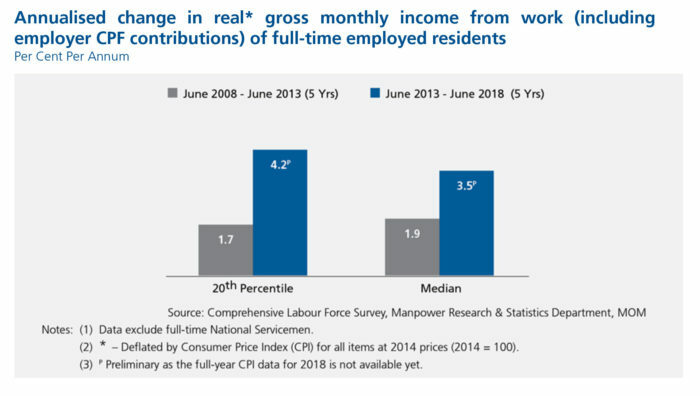 The real median income of full-time employed residents grew by 3.5% per annum from June 2013 to June 2018, significantly higher than the previous five years (1.9% p.a.). Further, real income growth at the 20th percentile grew faster than at the median, narrowing the gap between lower-wage workers and the median workers. 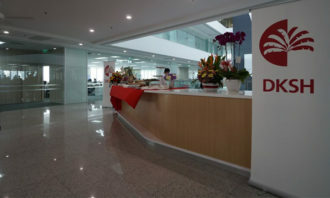 According to the report, this may be attributed to the tighter labour market as a result of foreign workforce policy adjustments, as well as other policy measures like the Progressive Wage Model, Wage Credit Scheme and Special Employment Credit.